Over the years Ive encountered several fuel tanks that failed as a direct result of inadequate support. When one stops to consider the loads that are imparted on a fuel tank, especially a large onesay, more than 250 gallonsits clear to see that a tank cant be too well supported. Three of the failed tanks I encountered, all of which were metallic, stand out as particularly illuminating examples. In each case, a crack or cracks developed because the bottom of the tank lacked sufficient support. Note that cracks may develop in any part of the tanknot just on the bottomas a result of inadequate support. The first case Ill call too much area and not enough support. The tank rested on stringers, athwartships, that were roughly 6 feet apart. The expanse of tank between the stringers, plainly visible from the bilge area, was entirely unsupported, which didnt present a big problem when the tank was empty or nearly so. However, when the tank was full, the nearly 2-ton weight of the fuel caused the bottom of the tank to flex. Added to this was the g-force of the vessel moving through a seaway. Eventually, the plate crystallized and cracked, spilling fuel into the bilges. In addition to welding, the repair included adding support to the tanks bottom. In another similar flex-induced failure, a large tank holding nearly 1,000 gallons spanned the entire beam of a vessel. The tank sat beneath the cockpit, where it rested on a closely spaced set of central stringers, as well as on supports located outboard, at the tanks extreme beam ends. Once again, when the tank wasnt full, it was capable of supporting itself and the weight of the fuel. However, once filled, the weight of the fuel (more than 3.5 tons) caused the beam ends to sag. There was a small gap between the bottom of the tank and the outboard supports: an installation defect if ever there was one. Further exacerbating the problem was the fact that this tank was aboard a high-speed offshore fishing vessel that was designed to pound and flex her way through tumultuous seas. As the tank absorbed these loads, it flexed, tooinitially, anyway. Eventually this led to failure at the fulcrum on the tanks centerline. Interestingly, the crack that developed did so precisely in the middle of a weld bead, indicating that the weld itself, as well as the plate, was sound. The structure simply could not absorb the movement caused by inadequate support. In the third example, a large set of tanks with a complex shapemuch more than a simple rectanglecould not absorb the flexing induced by the weight of the tank and the fuel, as well as the movement of the vessel. The tanks rested on stringers, rather than on a shelf. Cracks developed in welds in several locations, and while the welds themselves were suspect, I believe that if the tanks had been well supported, they would not have developed leaks. Tanks that are made up of multiple panels and angles require additional attention when it comes to support. This is particularly true when the bottom of a tank consists of multiple planes. If such cases, its vitally important that the tanks weight be evenly distributed on all of the mounting surfaces, which must precisely match the shape of the tank bottom. If there are gaps beneath any of the horizontal mounting surfaces, when the tank is filled with fuel, it is likely to flex, distort, and settle in areas that lack support. The larger the tank, the more important it is that the structure fully support the tanks entire bottom. Unless a tank is designed and built to be self-supporting (this would include internal reinforcement), all tanks ideally should rest on continuous, shelf-like structures, rather than on stringers or beams of some sort. When supported in this manner, flexing is minimized, if not eliminated. 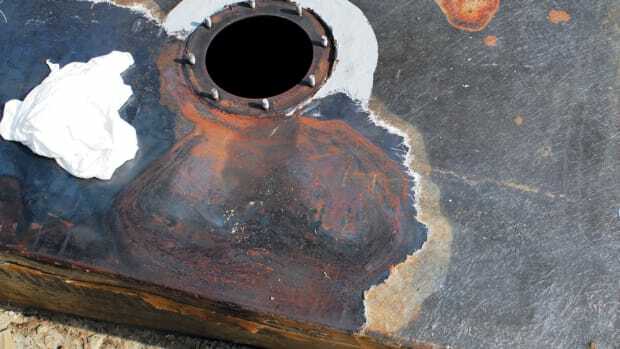 In order to promote drainage and prevent corrosion to a metallic tanks bottom, 1- to 2-inch-wide, ¼-inch-thick strips of non-hygroscopic material (prefabricated fiberglass or GPO-3 works well) should be bedded athwartships to the tank bottom, on 4- to 6-inch centers, using a polyurethane bedding compound. With this approach, the tank cant rest in standing water and water cant migrate between the tank and the shim spacers, both of which would lead to corrosion. A final note on tank installations relates to serviceability and accessibility. Once a tank has been installed, all serviceable componentsfill, vent, and supply fittings and senders, as well as inspection portsshould be accessible. Ideally, they should also be visible. Covering or sheathing a tank for cosmetic or acoustic purposes is a double-edged sword. It may look more attractive to some and it may offer minimal noise reduction in accommodations spaces, but it also means that leaks, corrosion, deteriorating hose, and other issues will probably go unnoticed. Given the choice, Id rather see the tank in all its glory. A fuel tanks serviceability includes being able to access every baffled chamber, a task that can only be accomplished through the aforementioned inspection ports. If your tanks arent so equipped, rest easy. 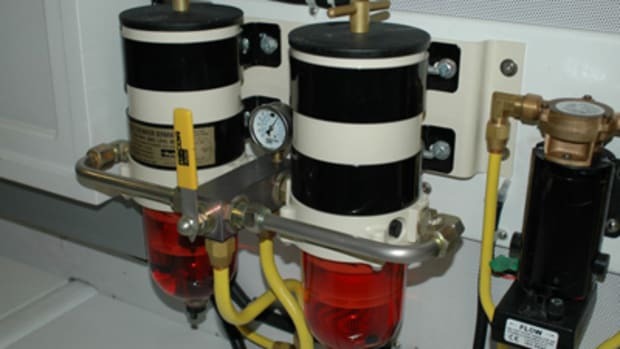 If you can get to the top or one side of the tank, inspection ports can be added using a kit (available from SeaBuilt; www.seabuilt.com). When it comes to cleaning a tank, there is simply no substitute for good access, and inspection ports make this possible. Steve owns and operates Steve DAntonio Marine Consulting (www.stevedmarine.com), providing consulting services to boat buyers, owners, and the marine industry. He is also PMMs technical editor.